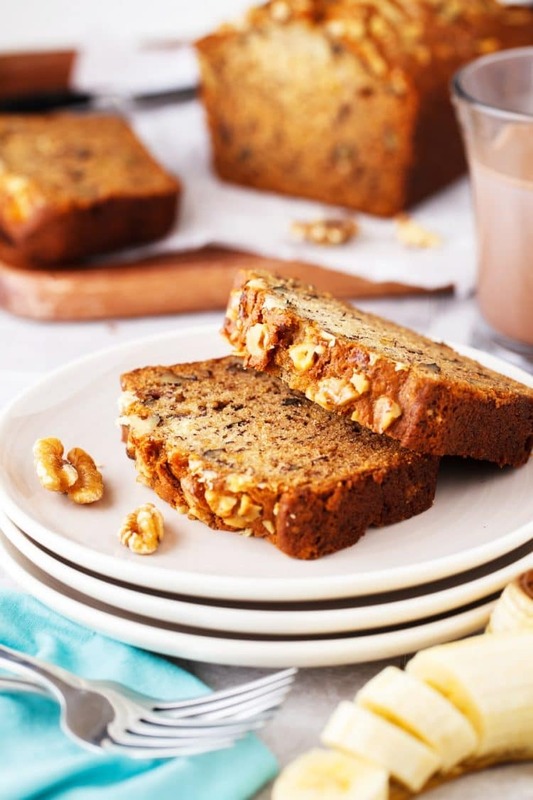 This Starbucks Copycat Banana Bread recipe is a delicious sweet bread loaded with walnuts and delicious bananas. It’s pure comfort and tastes amazing warm with a bit of butter! When I worked at Starbucks in college, there was one pastry that always had my love, their Banana Bread! I still get a slice at least once a month because I can’t resist! Back when I was working there, they actually used to have recipe cards for their pastry items and I was thankful to snag their banana bread recipe! I’m an absolute sucker for banana bread, my Grammie’s will always have my whole heart, but since her passing, no one has been able to find her recipe, so this one will have to do. This banana nut bread recipe is very simple to make and the end results are a tender and moist loaf of bread that you likely won’t want to share with anyone else. Begin by preheating the oven to 325 degrees F and grease a 9×5-inch loaf pan and dust with flour. Next, you’ll whisk together the flour, baking soda, and salt and set aside. In a separate bowl, whisk together the egg, sugar, and vegetable oil until combined. Add the flour mixture and mix just until combined, then mix in the buttermilk, vanilla, and mashed bananas until combined. Then, fold in 1/2 cup chopped walnuts and pour the batter into the prepared loaf pan. Top the batter with the remaining 1/3 cup of chopped walnuts and bake for 45 to 60 minutes, until a toothpick inserted into the center of the loaf comes out clean. Finally, let the loaf of bread cool for 10 minutes on a wire rack and remove from pan. Slice and serve warm or room temperature with or without butter. 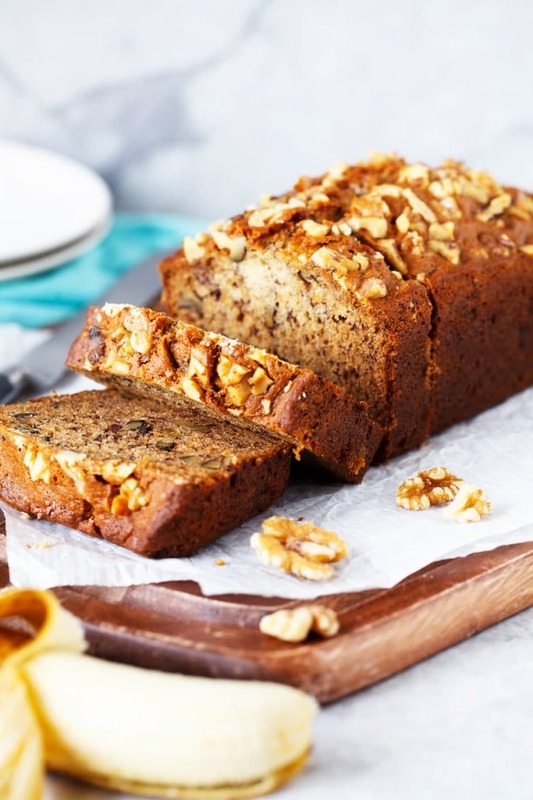 In my opinion, banana bread is the reason bananas even exist and once you try it, I’m sure you’ll agree! Seriously, there’s nothing more delicious than a warm slice of banana bread slathered in soft rich butter. 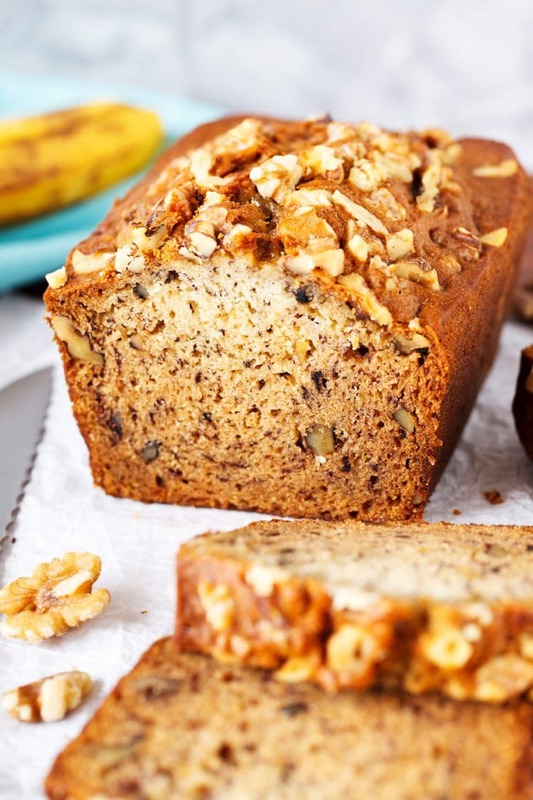 Each slice of this delicious bread is loaded with amazing banana flavor and chunks of walnuts! Unlike a lot of other recipes, this bread is made with a touch of buttermilk which adds a lovely little tang to the flavor. Always use very ripe bananas for the best flavor, the skin should be almost black and the peel should pretty much fall off. Don’t use frozen bananas for this recipe, when you freeze bananas they take on extra moisture which they retain even after being thawed and can mess with the outcome of the recipe. The walnuts are optional, so if you have an allergy, simply leave them out and it won’t impact the final product, but feel free to replace them with chocolate chips… YUM! I prefer to use a mixing bowl and whip this recipe up by hand, but you can use a stand mixer or hand mixer if you prefer. 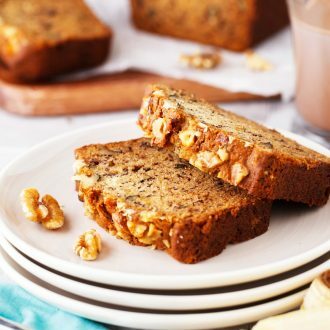 This Starbucks Copycat Banana Bread recipe is a delicious sweet bread loaded with walnuts and delicious bananas. It's pure comfort and tastes amazing warm with a bit of butter! Preheat the oven to 325 degrees F. Grease a 9x5-inch loaf pan and dust with flour. 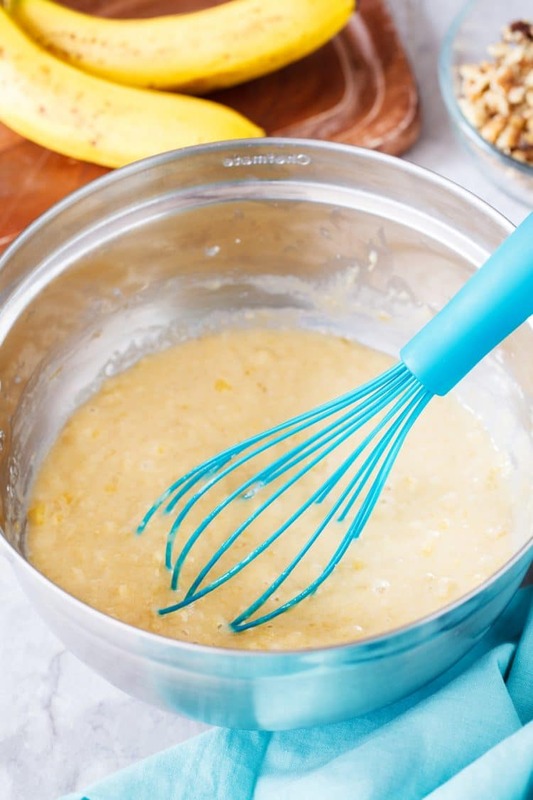 In a separate bowl, whisk together the egg, sugar, and vegetable oil until combined. Add in the flour mixture and mix just until combined, then mix in the buttermilk, vanilla, and mashed bananas until combined. Fold in 1/2 cup chopped walnuts and pour the batter into the prepared loaf pan. Cool for 10 minutes on a wire rack and remove from pan. Slice and serve warm or room temperature with or without butter. 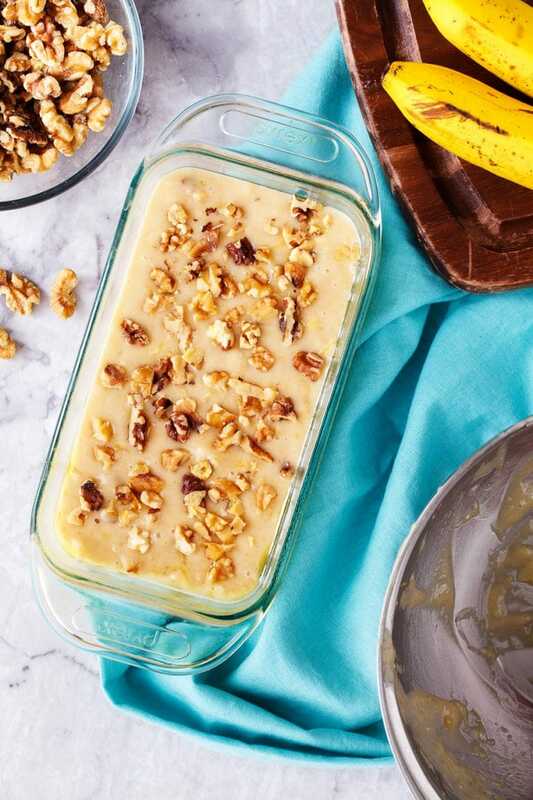 Don't use frozen bananas for this recipe, when you freeze bananas they take on extra moisture which they retain even after being thawed and can mess with the outcome of the recipe. The walnuts are optional, so if you have an allergy, simply leave them out and it won't impact the final product, but feel free to replace them with chocolate chips... YUM! I agree, bananas basically exist for lots of baking with bananas and banana bread in particular. I can’t wait to give this version a try! I love the Star$$$ version too. So glad you love banana bread as much as I do! This version is definitely a winner! Loving the walnuts in this recipe. I always think banana bread needs a crunch. Also great tip for not using frozen bananas!!! I am always freezing them and have never thought about how they may change a recipe!